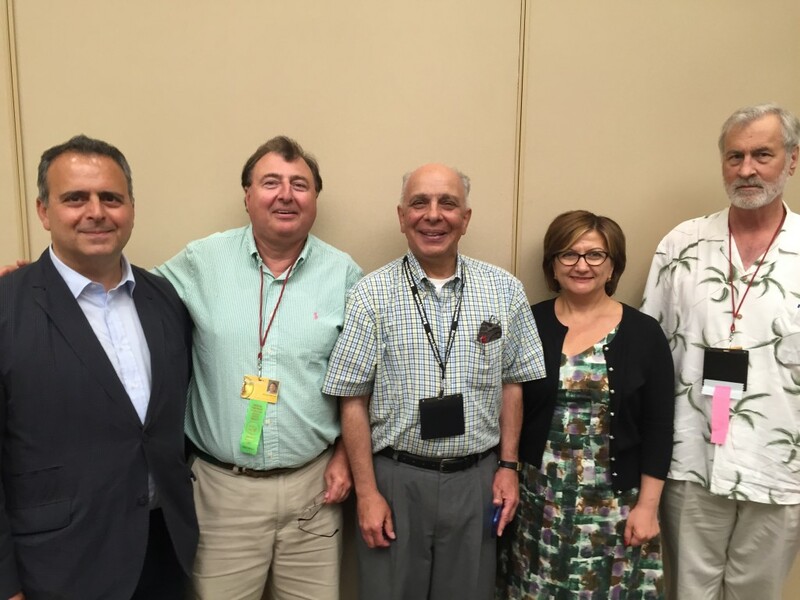 CHICAGO, IL–A new organization, the Armenian Numismatics and Antiquities Society (ANAS) was launched in August on the sidelines of the American Numismatics Association’s World’s Fair of Money in Chicago. This first gathering of the society included a public talk by renowned numismatic experts Dr. Levon Saryan and Frank Kovacs. The fledgling organization has a website and plans to publish a quarterly journal. Dr. Saryan is vice president and journal editor and Dr. Chuck Hajinian is president of the group. The goal of ANAS is to unite Armenians worldwide in their quest for knowledge about Armenian coins and related items and to provide a forum for them to share their collections, post items for sale, and exchange ideas. The website is intended to be a place where anyone can find interesting items relating to Armenian history. In short, a “virtual museum” available to anyone in the world. The website is a work in progress with pages set up for books, carpets, coins, embroidery, manuscripts, medals, and other forms of art. The initial focus has been on coins and numismatics, with plans to grow in the near future. The Los Angeles-based Armenian Numismatic Society operated successfully for more than 40 years but for various reasons its activity has diminished, which has created a void. “We have coins and artifacts all the way from prehistoric times to the present–these need to be presented to the world and to our own people. Despite the efforts of many people, most Armenians have only the vaguest notion of the heritage embodied in these items,” adds Hajinian. The launch event was significant since the World’s Fair of Money is one of the most prominent coin conventions in the US. Hajinian and Saryan discussed the new organization, as well as several specific coins and artifacts with experts and enthusiasts in the room. “The announcements in Chicago were this: We are here! This is our first meeting: join us, help us, have fun with us,” explains Hajinian. ANAS hosted two of the finest and most knowledgeable speakers on Armenian numismatics in the world–Frank Kovacs and Levon Saryan. Mr. Kovacs reviewed highlights from his forthcoming book on the coinage of ancient Armenia. His book recasts some of the figures of ancient history, dating even earlier than the better known Artaxiad Dynasty of Tigranes the Great. One of the objects discussed is believed to be the oldest Armenian gold coin in existence, dating to the period of 401 BC. Dr. Saryan presented several items for discussion, one of which was a rare medal issued by Russia in the 1830’s to commemorate the defeat of the Ottoman Turks in the eastern front. He also displayed extremely rare canceled checks from the early 20th century that were sent by Armenian immigrants from the St. Louis area to their families in the Ottoman Empire as a way of transferring their earnings. In the area of ancient rugs, Chicago area dealer Oscar Tatosian shared information about the organization of antique Armenian rug collectors. The ANAS leadership confirmed that one of its goals is to unite these organizations under the ANAS banner, in order to reinvigorate the topics and attract the interest of new generations to collect Armenian artifacts and understand their cultural, historical, and political relevance. Many questions were answered during the inaugural ANAS meeting, and it could easily have gone on for two more hours. The organization plans to hold events in other cities, with the hope of attracting dealers, collectors, and others with a curiosity or a family collection that has been passed down. Also, we are proud to announce the joining of the very fine Numismatic work of Aram Manasaryan’s Armenian Numismatic Research Organization (ANRO).